So the last ten years has seen my ageing from 11-year-old starting secondary school, to 21-year-old, out of University and working in the big wide world! I thought I’d put a few bits and piece on paper to sum up the decade that saw the entirety of my teens pass by (and my parents survive it!). Although I grew up in a church and a Christian family, this was the decade that I gave my life to Christ. This is really the biggest part of my decade – and life! It’s not been plain sailing, Jesus never promised us an easy life if we followed Him, but still, best thing I ever did! So 1999-2004 was spent at The Romsey School, which I must say, was the worst uniform I’ve had to put up with in my life! 2004-2006 Was spent at Barton Peveril College, which I much preferred! A college of 2000 students over 2 year groups, no uniform, free periods, calling teachers by first names, and a great group of friends! This wasn’t without exam results either, 4 A Levels for me here! So all suitably geeky, and these days I suppose I should point out that this was before A* A Levels existed! I met some amazing people at University, the Christian Union was probably the highlight here. With an average attendance of 150ish people it was virtually a ‘church from church’! Just felt like family. I miss them all a lot! There’s far too many people and photos to put just one here, but if you’re reading this on facebook there should be all sorts around! So apart from a couple of summer jobs, my main Saturday/holiday work was at Oasis Christian Centre. Amazing place there! Then this year, incase you missed it, I graduated from University and needed to find a proper job! 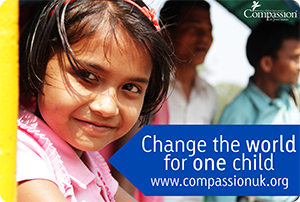 I’ve found a great job at Compassion UK which is great! I am a database specialist, and so get to use my academic skills in a role than enables and works for a charity whose purpose is “releasing children from poverty in Jesus’ name”, I feel massively privileged to be placed here!